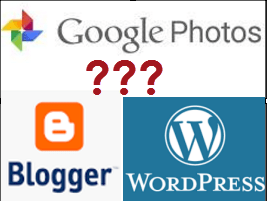 Can I use my Google Photos Pictures in my Blog? If you’re like me, you are using the amazing capabilities of Google Photos as a home to your lifetime of photos. Also, if you’re like me, you have a blog and you want to add photos to your blog posts. I’ve been getting a lot of people lately asking the question, Can I use my Google Photos pictures in my Blog? The answer is Yes! But, the process differs depending on what you’re using for your Blog. The most common blogging platforms are Blogger.com and WordPress.com. I’ll cover each of them separately. This better be simple! After all, Blogger is also made by Google. Well, even though it is easy, it’s not exactly simple because there are 6 ways that Blogger can insert pictures, and all but the last one involves Google Photos for hosting the picture. When you are creating or editing a post in a Blogger blog, you click the “Insert Image” tool to get a picture. Then you will see several choices. I almost always use option #3. Upload: this option gets a picture from your computer (it doesn’t work on mobile devices.) It uploads that picture to a special Web Album just for that Blog. For example, if your blog is My Excellent Adventure, then you will have an album with the title My Excellent Adventure. This album is hidden from view in Google Photos, but is still visible using the Picasa Web Albums interface. www.picasaweb.google.com When you view that album, you will also see the Blogger logo, and a link to View Blog. From this Blog: This refers to the special Web Album for this blog. It contains all the previous pictures used in this blog that were either uploaded from your computer, or copied from your phone. I have never felt the need to add a picture that was already on my blog somewhere else, so I don’t use this option. **From Picasa Web Albums: This option gets any picture from your Google Photos library that has been collected in an Album. It is misleading that the name is from Picasa Web Albums. It does not need to be an album created by Picasa. An album created strictly with Google Photos will be available here. This is the option I use most often, because the first step in my photo process is deciding which of my photos are the best and putting them into albums. Those albums then become my source of pictures for my blog. From your phone: This does not mean directly from your phone. This assumes that you have Google Photos installed on your phone and you have the Backup and Sync turned on. If that is the case, then all the pictures you take with your phone are in your Google account, and you can use them in your blog with this option. If you do pick a photo using this option, it will be copied to the special photo album for this blog – so you need not fear it being deleted from your main photo library. From your webcam: This means to take a picture (or a video) with the camera built into the screen of your laptop. If you use this option, the picture will be stored in the Web Album for your blog. From a URL: This means that there is a picture somewhere on the Web, maybe even one that does not belong to you, and you want it to show up in your blog. URL stands for “Uniform Resource Locator” – it is simply the Internet address for any given picture. For example, I have a Facebook friend who is a great photographer. If I want to talk about him and put one of his pictures on my Blog, I can go to where he posted a picture in Facebook (he must have posted it publicly, or this won’t work) using Chrome I can right-click and Copy image URL. Now I come back to Blogger, Insert Image, From URL, and paste what you just copied. You should see the picture, then click OK.
WordPress can host your pictures directly, unlike Blogger. When you have a WordPress blog, you have a media library folder. You can use the “Add Media” button and the “Upload Files” to add a picture, from your computer to your media library. But that’s not what we’re covering here. What this article is covering is how to use a picture that is already uploaded to your Google Photos library. WordPress is not owned by Google (WHAT?!) so it doesn’t work directly with Google Photos. There may be plugins that can do this, but that’s another topic. In another Chrome browser tab, visit www.Photos.Google.com click on Collections, then click the down arrow and choose Albums. It is very important that your desired picture be located in an Album, otherwise only you will see it. Go back to the WordPress tab that you just left and paste the URL. Then click “Insert into post” – it’s a blue button in the lower right corner. When you do this, the picture will show up in your blog post, but it will not be taking up any space in your blog’s server structure. It is just referencing the photo in your Google Photos Library. If the picture should ever get deleted from Google Photos, or moved from the Album it is in, then the picture disappears from your blog post. Note Aug 2016: this technique no longer works! see this post: embedding photos from Google Photos. Do you have any other techniques for inserting pictures into Blog posts? Please leave a comment – we’d be happy to hear them. Published by MrsGeek, in Blog. Tagged with #GeeksWhoTeach, Blogger, Blogs, Droid, Geeks on Tour, google, Google Photos, iPad, iPhone, Smartphones, WordPress. You have such wonderful posts with easy to understand directions! I have a problem that I cannot find covered in your posts. I cannot find my blog photos when I go to Google Photos. If I go to my blog and click the “upload from this blog” I see all the photos I ever posted. However, when I go to my Google Photos, those albums are not there. Can I still find the albums somewhere? Mary – thanks for the compliment! I do mention that hidden album in this article – it’s buried under #1: This album is hidden from view in Google Photos, but is still visible using the Picasa Web Albums interface. http://www.picasaweb.google.com When you view that album, you will also see the image Blogger logo, and a link to View Blog.